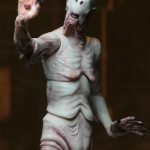 NECA revealed new photos of another character from Guillermo del Toro's beautiful world to get a collectible figure as a part of their Guillermo del Toro Signature Collection, and it's The Pale Man, played by Doug Jones, from Pan's Labyrinth. 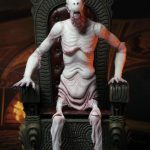 The figure comes with moveable body parts and its embellished throne featured in the photos. From NECA: "The second release in NECA’s new collaboration with renowned director Guillermo del Toro! 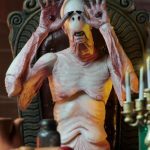 The Guillermo del Toro Signature Collection brings select characters from del Toro’s movies to life in premium action figure format with deluxe added elements. 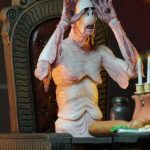 From the dark fantasy film Pan’s Labyrinth, the grotesque Pale Man is super-poseable and comes with a detailed Underworld Throne. Collectible deluxe window boxed packaging." To learn more about this action figure, visit NECA online.